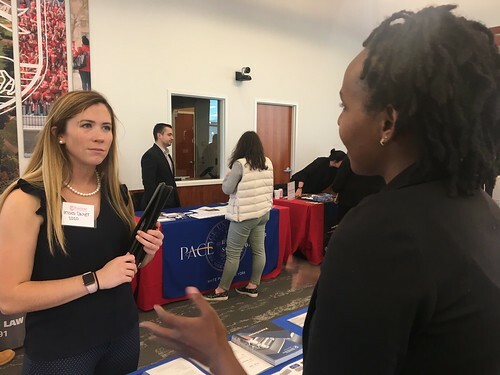 Fairfield University students had the opportunity to attend two career fairs last week: Nursing Career Fair and Law School Fair. Career Fairs are a valuable opportunity for students of all majors and class years to explore careers, network with employers, discover internship and employment opportunities, and network. 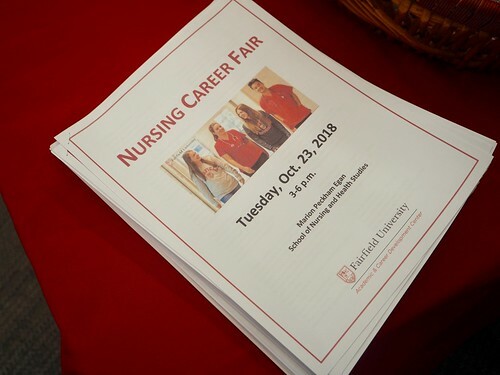 More than 130 nursing students from all class years attended the Nursing Career Fair held in the Marion Peckham Egan School of Nursing and Health Studies on October 23. Students had the opportunity to meet with almost 20 hospitals and health care agencies. Among the list of organizations in attendance were Northwell Health; Penn State Health; St. Vincent’s Medical Center; Silver Hill Hospital; U.S. Army Health Care; VA Hospital; The Atlantic Health System, a network of eight hospitals; and Yale New Haven Health, representing six hospitals including Bridgeport and Yale New Haven Hospitals. Approximately 60 students from the College of Arts & Sciences, the Dolan School of Business and the School of Engineering attended the Law School Fair sponsored by the St. Robert Bellarmine Pre-Law Society on October 25 in the Kelley Presentation Room. Twenty law schools were in attendance, including Albany Law School, Boston College Law School, Boston University School of Law, Fordham University School of Law, School of Law at Hofstra University, Pace Law, Quinnipiac School of Law, Roger Williams University School of Law, Seton Hall Law School, St. John's Law School, Suffolk University Law School, Touro Law Center, UConn School of Law, and University of New Hampshire School of Law. Olivia Piluso, ’19 who has applied to several law schools, said, "The Law School Fair was a great opportunity to see a majority of the schools I applied to. I was able to ask questions and enhance my connections with the schools, which is very important during the application process. I am looking forward to keeping in touch with them as I wait to hear back!"